The Romani diaspora: Middle East, Europe, and North America but originally in India. After the diaspora, worldwide. The Romani (also spelled Romany), colloquially known as Roma, are a traditionally itinerant ethnic group living mostly in Europe and the Americas and originating from the northern Indian subcontinent, from the Rajasthan, Haryana, Punjab, and Sindh regions of modern-day India and Pakistan. Genetic findings appear to confirm the Romani "came from a single group that left northwestern India about 1,500 years ago. 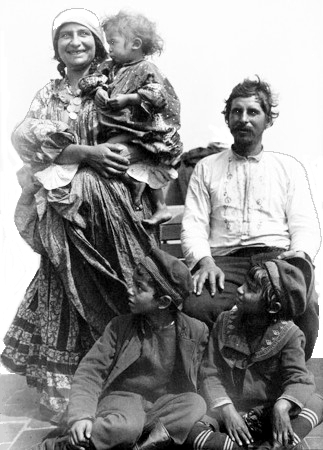 The Romani are widely known among English-speaking people by the exonym Gipsies, which some people consider pejorative due to its connotations of illegality and irregularity. They are a dispersed people, but their most concentrated populations are located in Europe, especially Central, Eastern, and Southern Europe (including Turkey, Spain, and Southern France). Since the 19th century, Romani have also migrated to the Americas. Languages: Various dialects of Rom. Religions: Most Romani people are Christian, others Muslim, some retained their ancient faith of Hinduism from their original homeland of India, others have their own religion and political organization. Ushti, Ushti, Baba, on Album 1. "Karana sings this in the Romany language, a language nearly 2000 years old and descended from Sanskrit. She learned it while teaching Romani children at the Romany School in Richmond, California. The bride sings on the morning of her wedding, "Hurry, hurry, father! Wake up! You will be late for my wedding!"